CBSE CTET results 2019 Declared @ cbseresults.nic.in: The CTET 2019 exam was conducted for candidates to be eligible for selection as a teacher for classes 1 to 8. CBSE has declared the result of Central Teachers Eligibility Test (CTET) on its official website. The exam was conducted in July, 2019. The CTET scores apply to schools of the Central Government (KVS, NVS, etc) and schools under the administrative control of UT’s of Chandigarh, Dadra & Nagar Haveli, Daman & Diu and Andaman & Nicobar Islands, Lakshadweep and NCT of Delhi. The Ministry of Human Resource Development has entrusted the responsibility of conducting the Central Teacher Eligibility Test (CTET) to the Central Board of Secondary Education Delhi. The Central Board of Secondary Education issued the Central Teacher Eligibility Test(CTET) 2019 Notification. The CBSE, Delhi was conducted the Central Teacher Eligibility Test (CTET) in September 2019 (Sunday). The CTET is one of the most coveted examinations of the country for teaching jobs. The examination, along with other teaching examinations on similar lines conducted by state boards, is for recruitment of teachers at the school level. CTET scores apply to schools of the central government ( Kendriya Vidyalaya Sangathan, Navodaya Vidyalaya Samiti, Central Tibetan Schools, etc) and those under the administrative control of Union territories of Chandigarh, Dadra and Nagar Haveli, Daman and Diu and Andaman and Nicobar Islands, Lakshadweep and the National Capital Territory of Delhi. These scores may also apply to unaided private schools that may exercise the option of considering the CTET marks. Schools owned and managed by the state government/local bodies and aided schools shall consider the Teachers Eligibility Test (TET) conducted by the state government. However, if a state government decides not to conduct the state TET, it can also consider the CTET scores. Candidates, who were applied through Online for CTET 2019 on CBSE/CTET website, they were appeared the CTET and now they are waiting for their results. Candidates can check their results at given the following link. 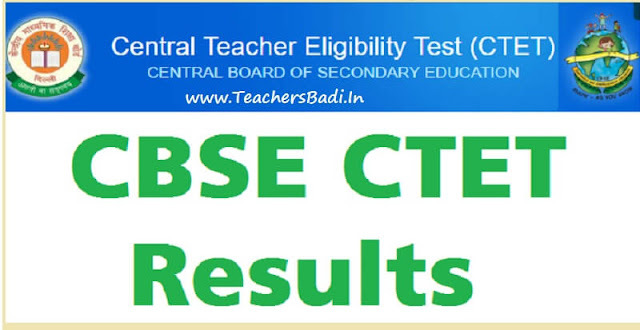 The Central Board of Secondary Education (CBSE) on Monday declared the results of Central Teacher Eligibility Test (CTET) 2019 on CTET’s official website . The examination was conducted at 851 centres in 91 cities in India and abroad on September 18. A total of 6,53,156 candidates registered for the exam. The mark sheet of the candidates who had appeared and certificate of those candidates who have qualified will be dispatched shortly. Candidates can view their results by logging on the official website of the CTET, ctet.nic.in. The results have also been published on the CBSE website, cbse.nic.in. Candidates will need to enter their roll numbers to access their results. The CTET exam is held to shortlist eligible candidates for the post of teachers for classes 1 to 8 in government run schools such as Kendriya Vidyalayas, Navodaya Vidyalayas and the Central Tribetan Schools, among others, in Union Territories. Private unaided schools can also recruit teachers through the CTET score of successful candidates.